NANOMXCN-Cancun: 4th Mexico-China Workshop on Nano Materials / Science / Technology: Renewable Energy and Environment Remediation, part of the XXVII International Materials Research Congress (IMRC), 19 al 24 de Aug 2018. Cancún, México. The first Bi-National Mexico-China Forum and 5th NANOMXCN Workshop will be co-sponsored by the National Council of Science and Technology of the United Mexican States (CONACYT) and the National Natural Science Foundation of China (NSFC). Your participation would be a great support to the NANOMXCN group as we strive to promote synergetic efforts between multi-institutional partners in Mexico and China. We believe these efforts are desirable for increased scientific and technological cooperation between Mexico and China in a rational manner with maximum utilization of resources. It would be a great privilege if you could join and support this memorable event. NANOMXCN (read: NANO-Mex-China) is a workshop series seeking to promote enhanced collaboration in science and technology between Mexico and China, including Hong Kong SAR with the very important support of colleagues worldwide. The workshop is open to all registered participants of the XXVII International Materials Research Congress (XXVII IMRC). 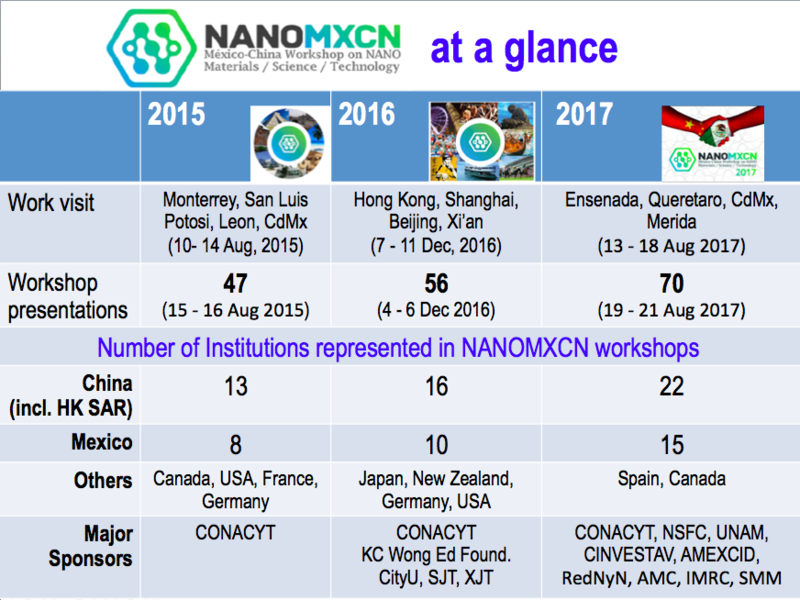 Previous NANOMXCN events took place held in 2015 (15 – 16, Aug in Cancun as part of the XXIV IMRC meeting), 2016 (4 – 6 Dec 2016 in City University of Hong Kong), 2017, (19-20 Aug in Cancun as part of the XXVI IMRC meeting). Besides, these meetings, the first Topical School NANOMXCN Workshop on Nanosafety and Nanotoxicology – 2018 (NANOMXCN-TOX) took place at Universidad Autónoma de Aguascalientes (UAA), 26 Feb to 01 Mar 2018. Below please find a summary of these activities. We also invite you to download or previous books of abstracts and links to News and Blogs. This website will be updated soon, please visit us again!